In the summer of 1998, my husband (then handsome boyfriend), created this scrumptious recipe and asked to cook for me. We were young and in love, which explains why I was shockingly willing to try this dish, although I normally wouldn't have eaten seafood if someone paid me. To my surprise, it was love at first bite! That's when I knew I must marry this culinary genius. Ok, maybe it also had something to do with how I fit perfectly in his arms, his love for the Lord, and clear adoration of lit'l ol' me, but these mouthwatering enchiladas showed me that this boy could make staying at home feel like a delicious vacation on a plate! 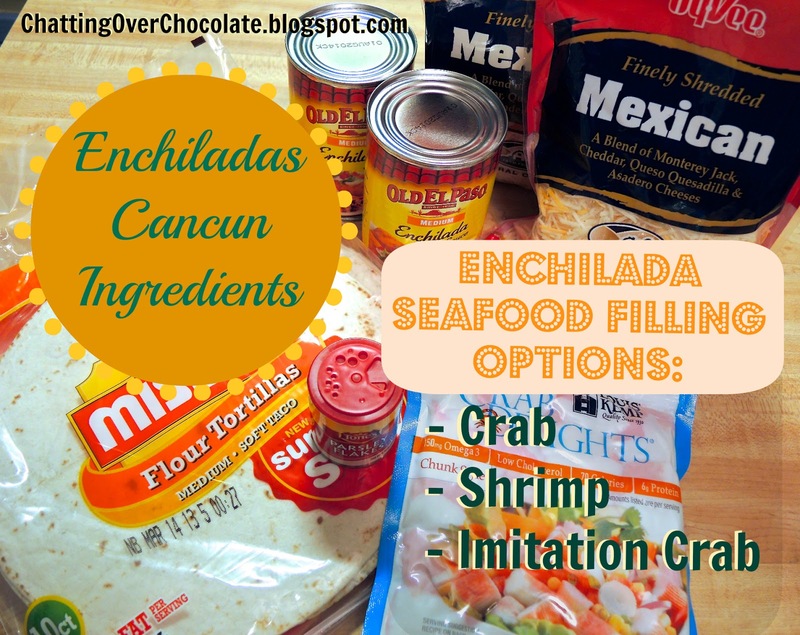 Easy Cheesy Seafood Fiesta Time! 1. Preheat oven at 375 degrees. 2. In a large bowl combine cheese, your choice of seafood, one and a half cans of enchilada sauce (reserving half a can to top enchiladas with). 3. Spray 9x13 glass dish with nonstick cooking spray. 5. Wrap filled tortilla and place into prepared 9x13 dish, seam side down. Repeat with each of the remaining tortillas and filling. 5. Pour remaining half a can of enchilada sauce over the top of enchiladas. 6. Sprinkle with parsley flakes. Brenda, this looks delish! 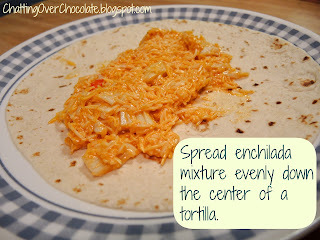 My oldest son (middle child) LOVES fish tacos so I pinned this so I could make this one night..I'll LOVE it! Thanks so much for sharing! These look great! 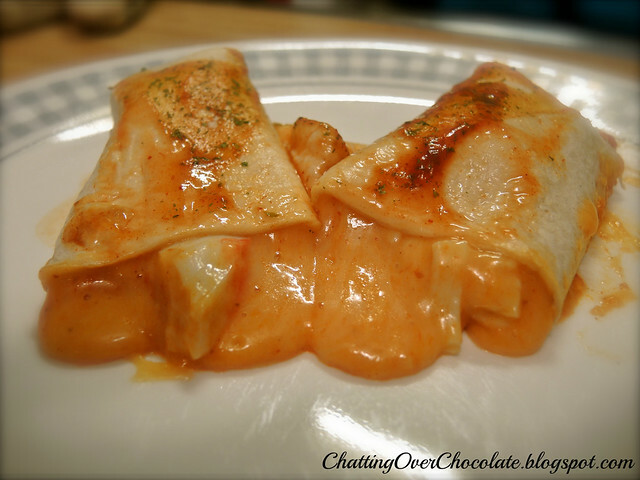 And a great variation of the chicken enchiladas I always make! There is a restaurant about 30 minutes from my house that makes these. Now I can make my own and save the drive! I love seafood enchiladas but can't remember ever making them for myself. This is going on my must-make list. Thank you for sharing! I'm so glad to have found your lovely blog. Wonderful tutorial/recipe! It looks easy enough for me to try and my husbnad would love it!!! Wow, these look fabulous! Thanks for sharing! Oh, being raised in the Southwest....I love anything Mexican food. Enchiladas are so yummy! I don't make them as often as I would like. Now I'm getting hungry for some. Thanks for the recipe. Thanks also for linking these up at my Real Family Fun link party. These look amazing. Have a great day. These look FANTASTIC. I'm SO making them. 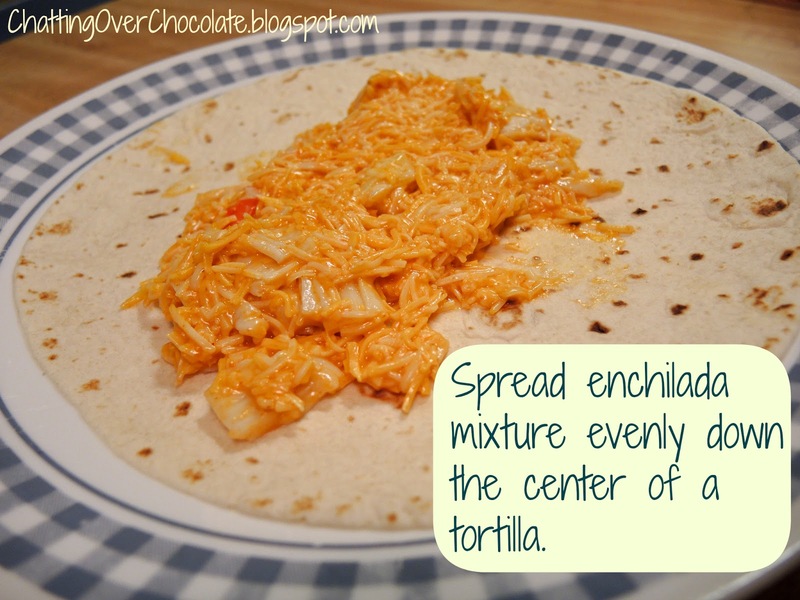 I love all things enchilada! Oh girl talk about oeyy goodness! Yum girlie! 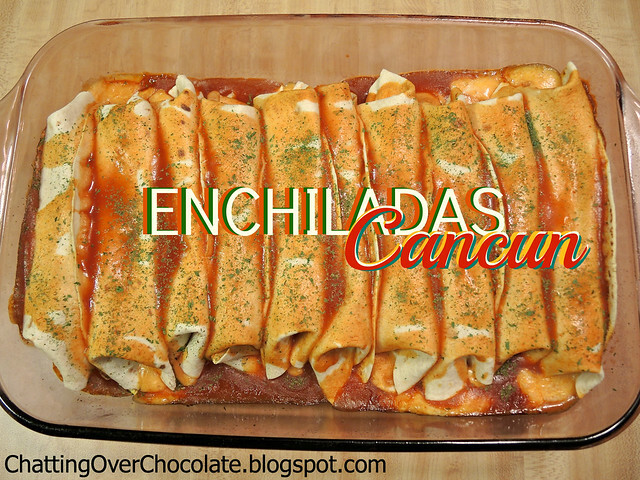 Thanks for sharing this recipe for Enchiladas Cancun at this weekends link party @The Weekend re-Treat! This looks yummy and easy! My family loves enchiladas! Will use this recipe next week! Thanks! These look great! Thanks for sharing at Pinworthy Projects. I made enchiladas with seafood many, many years ago and it was a total flop. I so need to try these to redeem myself!! This looks so delicious - can't wait to try it! 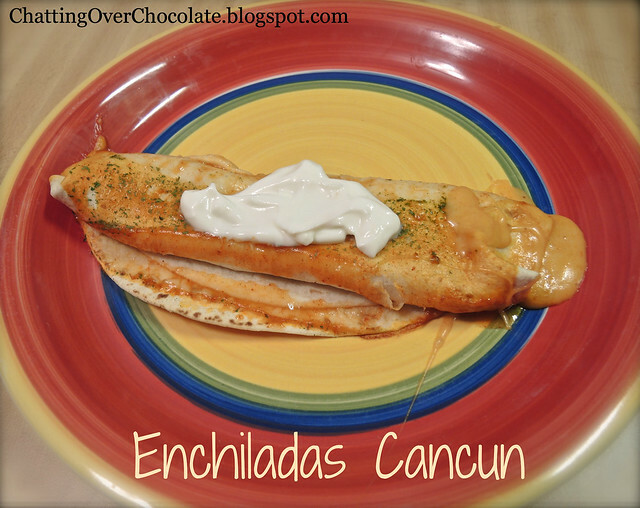 Your Enchiladas Cancun are just amazing! Hope you are having a great weekend and thank you so much for sharing with Full Plate Thursday. I love that these look so tasty and are easy to make! I am a seafood lover! so I would totally enjoy this enchiladas! Wow these look amazing....they are a must try! Thanks for sharing them at THe Patriotic Pam. I just pinned this for you too! Have a great weekend! These look so good. Saw these at the Marvelous Monday Link Party. Wow! Will Have to try! Oh these sound amazing..and easy which I love. When I make tortillas I had fry each corn tortilla before rolling them and its a pretty serious task. I've never thought to make them with flour before. Love it! Those look so good............Thank you for sharing with the Clever Chicks Blog Hop this week; I hope you’ll join us again! Interesting addition with the seafood! Sounds really good! Gotta love seafood & Mexican, great combo! I've never thought of doing a seafood version of these, very clever. Thank you so much for sharing with Saturday Spotlight last week. I hope you come by tomorrow to share more of your awesome creations! I love this simple recipe. It's great for a quick weeknight meal. Thanks so much for sharing on Marvelous Mondays. Carrie and I will be featuring this at tomorrow night's party! Wow, this looks so yummy!!! My mouth is watering ;) I love love love mexican dishes! mmmmm...this looks fantastic! Pinned it to my "Oh.my.yum" board to try sometime!! Thanks for linking up to my Show Off Your Shell Party!! Wow.. its really new for me and looking so much yummy.. I can't wait to try this.. Thanks for mouth watering dish..